Call 1-877-839-3330 for a shipping quote. 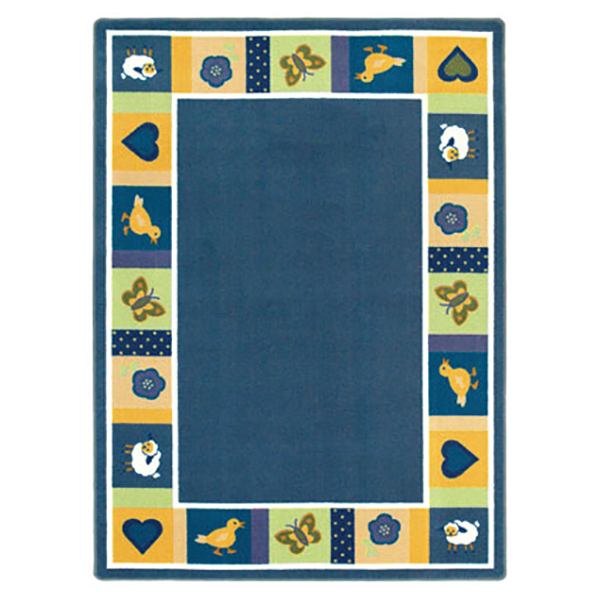 The Baby Blues Preschool Rug features a comforting border of sheep, ducks and butterflies. This comforting rug can be ordered with a soft or bold color style, and the blues, greens and yellows will coordinate with any decor. It's injection dyed for maximum image clarity and fade resistance. Constructed of STAINMASTER® carpet fiber, this durable school rug resists crushing and abrasion. The SoftFlex™ backing system and serged nylon edges withstand busy classroom environments. Stain shield and antimicrobial treatments repel dirt, germs and odors, extending the carpet's life by up to 50%. The Baby Blues Preschool Rug is made in the USA.